This movie completely lived up to all of my expectations!!! I expected it to be horrible, and it was! Lets start with the obvious, Sam Worthington. He worked out okay in Avatar because he spent most of his time blue and in a world that took most the focus off of his "acting" so he was a little easier to ignore. 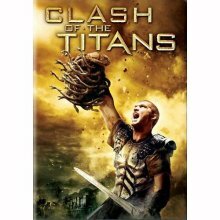 In Clash of the Titans, there's no hiding for him. You have to suffer through every monotoned line and cringe through every struggled facial expression. I think I'd rather take on one of the eyeless fates. I suppose the effects were sort of cool and I liked seeing Hades flying around with his smoky, fiery wings (plus I think Ralph Fiennes is great since Shakespeare in Love). But as much as I dig Liam Neeson I just couldn't take the poor man seriously in his shiny, sparkly Zeus armor. I didn't realize that Greek Gods dressed up like knights in a jazz dance recital. The whole thing was just very...blah. That's right, I'm not even going to search for a more poetic word than that. A movie that can't even make a scene with a guy bursting from the inside of a scorpion look cool doesn't deserve a better word than, blah. Motherly Advice: In the first place don't waste your time. But if you insist on doing so here's what you need to know: This movie is about a Greek time war, so there is fighting.Even with your filters set you'll still see some battling against creatures like giant scorpions, flying gargoyle type thingies, the three nasty fates, snake-like Medusa and a behemoth Kraken with razor sharp teeth. A short scene is clipped of Zeus behaving as Zeus will do...you know, acting immorally with mortal women. A couple quick instances of language are clipped. With filtering, I think this one would still be too scary for little ones. The creatures are frightening and dark and the scenarios are intense (if you can take them seriously) so I'd say let the little ones watch Bee Movie as mine did and save Clash of the Titans for the insanely bored older teens and adults.